History professor Brenda Stevenson researches issues of gender, family and community during the slavery era. She's the winner of the 2014 Gold Shield Faculty Prize. In history professor Brenda Stevenson’s family, there is a unique portrait of her two great-grandfathers on her mother’s side. One of them — Albert Williams, who was part African American, part Native American — has light brown skin, while the other, Henry Gerald, is blond and blue-eyed. The contrast is striking. “We would see these pictures and think, who are these men?” Stevenson said. She noted that Gerald, her mother’s paternal grandfather, was the son of a slaveholder and looked Caucasian. Stevenson’s mother had described Gerald as “a very mean man,” despite his being well-respected in the community as a large landholder. Stevenson later discovered that Gerald had been traumatized by what he had witnessed as the child of a slave. His mother had been repeatedly raped by his father; if she resisted, she would be whipped, and Gerald was then forced to wash her down with salt water. Stevenson — whose family roots are deeply entrenched in the South — was fascinated by her mother’s stories when she was growing up. Today a recognized authority on African American history, Stevenson has conducted extensive research on the dynamics of gender, family and community during the slavery era. On June 5, Stevenson was presented with the 2014 Gold Shield Faculty Prize, a $30,000 award sponsored by Gold Shield, Alumnae of UCLA. The prize is given annually in recognition of outstanding scholarship, teaching and service by an exceptional mid-career full professor in a department with an undergraduate program. Lynn Dines (from the left), president of Gold Shield; Brenda Stevenson; Tanis Harris and Rochelle Ginsburg, members of the Gold Shield faculty prize committee. While Stevenson’s research and writings have focused primarily on the 18th- and 19th-century American South, she recently won the 2014 James A. Rawley Prize from the Organization of American Historians for her book “The Contested Murder of Latasha Harlins: Justice, Gender and the Origins of the Los Angeles Riots” for being the best book on race relations published in 2013. 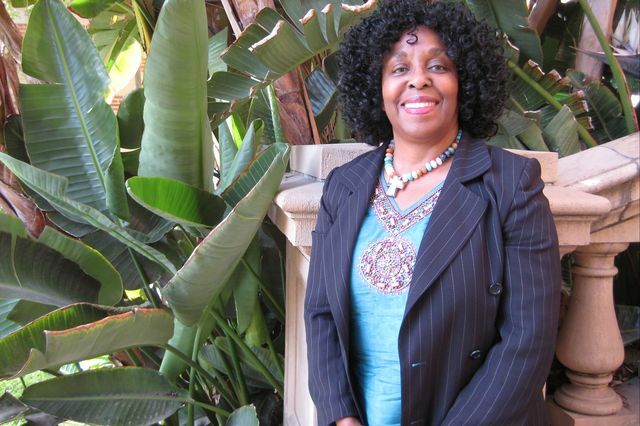 She also is past chair of the UCLA Department of History and past chair of the Interdepartmental Program in Afro-American Studies. Stevenson helped write the proposal to create the Department of African American Studies that was recently unanimously approved by the Academic Senate. Although all factors seemingly pointed to a career in academia, Stevenson originally considered becoming a physician. She suffered from severe asthma as a child, and her mother, Emma, feared letting her leave the house on the chance that Stevenson would have an asthma attack. So Emma bought her middle child plenty of workbooks and often took her to the library. Stevenson’s father, James, also was a big believer in education and bought subscriptions to all sorts of magazines — Time, Life, Ebony, even Better Homes and Gardens — for his daughters’ benefit. A self-described “science geek” at her high school in Portsmouth, Virginia, Stevenson enrolled at the University of Virginia and soon found herself drawn to literature and history. She received her bachelor’s degree in African American studies from Virginia, an M.A. in African American studies from Yale University, and M.A. and Ph.D. degrees in American history, also from Yale. The fledgling historian’s first job after Yale was as an acting assistant professor at the University of Texas at Austin from 1988 to 1990. 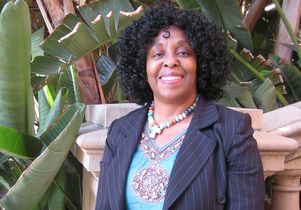 In January 1991, Stevenson became an assistant professor at UCLA’s history department, part of the UCLA College, where she currently teaches undergraduate and graduate courses and seminars on slavery and on African American, U.S. and women’s history, plus a general education cluster on interracial dynamics. Stevenson’s students have gone on to tenured positions at UC Irvine, the University of Kansas, the University of Mississippi and Indiana University, among others. One such student, Marne Campbell, earned her B.A., M.A. and Ph.D. degrees at UCLA and is now an assistant professor of history at Loyola Marymount University. Stevenson, who lives in Los Angeles with her husband, James (they have one daughter, Emma), is finishing her third book, “What is Slavery?” She is continuing to work on a history of slave women from Africa through the antebellum South and is writing a selection of plays based on documents from the slave era. 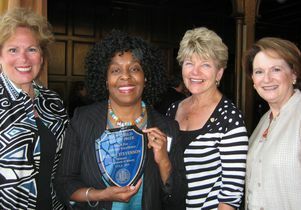 Brenda Stevenson and members of Gold Shield, Alumnae of UCLA.